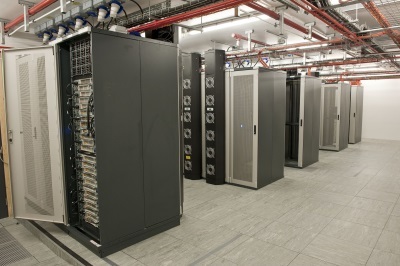 We operate a number of data centres on the NBI campus, of which two are hybrid high-medium density facilities designed to accommodate a mixture of High Performance Computer Systems and high volume enterprise storage. Compared with other types of IT equipment, HPC systems typically pack many CPUs into a relatively small space, which in turn concentrates the power draw and heat production. We have taken a hybrid approach to cooling, to accommodate a mixture of power densities ranging from 3KW to 30KW per rack.